One recent beautiful morning with a low cloud cover keeping it dark and cool but not too dark, I am sitting in my chair with Josie, drinking tea, thinking over the day to come when I see Elliott streaking across the southside yard and hear the thud of him landing on the porch. Josie looks up, perks his ears, furrows his brow. Elliott scratches at the door and this always sounds frantic but I think that’s just me reacting to the mental image of those slivers of wood being gouged out of the door frame, but anyway, we get up to let Elliott in, and Josie is pretty excited to go out, so out we go, Josie streaking past Elliott, bounding off the porch, bouncing around the yard barking. Elliott sits down. I wonder what all the fuss is about. Josie streaks over to the southside yard and I see the deer there in the tall grass. Elliott perks his ears, his eyes on Josie, or maybe his eyes on the deer, and now I understand why Elliott was streaking across the yard, landing with a thud on the porch, tearing apart the door frame. 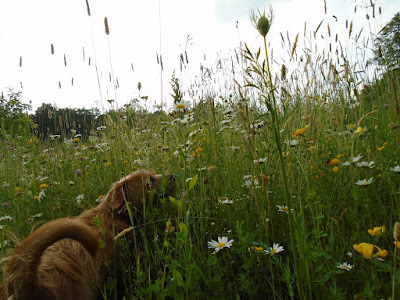 At the edge of the lawn and the tall grass Josie jumps and barks before diving in like a swimmer and as he veers to and fro making waves, creating a wake, like a shark, like a dolphin, the deer leaps a few yards to the right, stops behind a tree. The meadow sways and moves and I hear Josie’s boof boof and then Josie catapults out of the sea of grass back onto shore, onto the lawn, where he dances and prances and boofs and barks and the way he is running around I’m pretty sure he’s lost sight of the deer, but we all watch The Josie Show, Elliott, the deer, and I, and then I catch Josie’s eye and he barrels across the yard, onto the porch, skidding to a stop, licking Elliott's face, Elliott backs away. As we head in for breakfast the deer comes out from behind the tree, walks out of the tall grass into the yard, munches the twigs of a dogwood. On another day, Josie contemplates a mosey into the meadow. Another morning and we are inside and it is warm and light and through the kitchen window Josie can see a deer out there a’ways in the wildflowers. He goes a little crazy, whining, running around, looking out any window he can, making little noises like air seeping out of a balloon, about to blow, about to whiz around the room in one big blast of released pent-up air. So I open the door and he charges out, sails off the porch, runs and hops all over the southside yard before he realizes the deer is off the front yard, just standing there, entranced, amused, taken aback, curious, who knows, the deer standing out there in the wildflowers watching Josie go off his nut because there is a deer out here somewhere, I know it!, Josie does, because he saw that dang deer from the window. Now, where is he? Aha! Josie tears into the field that is two to three times his height and I can see him out there like a jumping bean, a cartoon, what’s that game about hitting a mole? First his head pops up here, then his head pops up there. 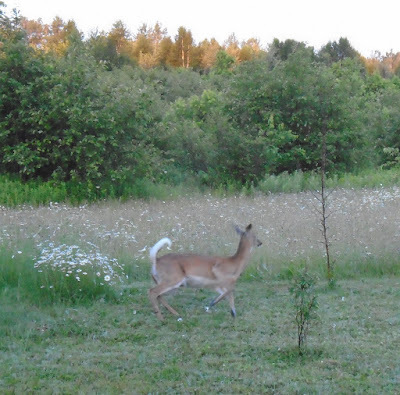 The grasses are swaying and praying and the deer dashes off a bit, then stops. Watches. Is he perplexed? Is he amused? I must get the camera. By the time I return, Josie has emerged from the field, is in the yard, and the deer follows. What? Say what? This has never happened before. 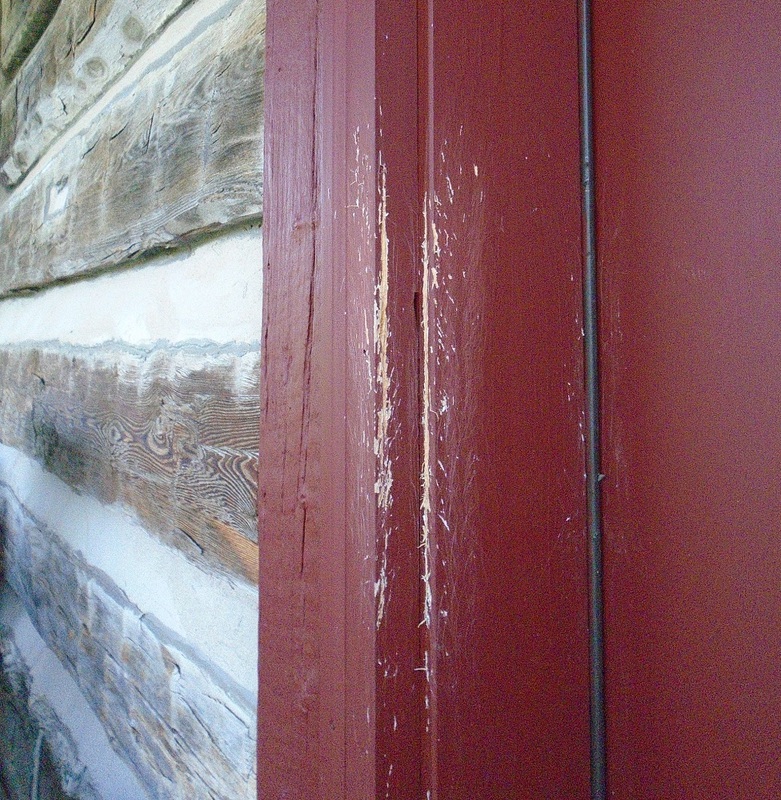 At first, several months ago, the deer ran from Josie at first bark, lickety-split, then, slowly, they stopped being so quick. They stopped being afraid? They would move off a bit. Move back. Josie did not chase them too far, after all, and perhaps they learned his limit. Started testing his limit. Now. This deer. This guy here. Walking into the yard, straight at Josie. Looking at him. What the … jeepers. Oh! For a little foresight! How I wish I had kept the film rolling! If you watch the video, you may notice those two big bare twigs sticking up out of the ground. One is in the yard, one is in the field. Those are the apple trees I planted two years ago with such dreams of apples and yes, they seem to have croaked, but I was not without hope because the one in the yard has/had a couple of little, low branches, the most viable one just yanked off, munched on, and spit out by this deer. Jeepers (again). Who does he think he is? 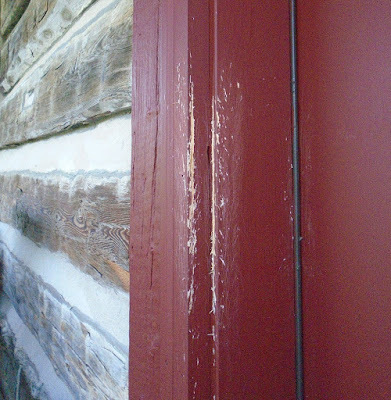 The deer does that slow deer lope thing, advancing on the cabin, and Josie retreats onto the porch. I think this video is spent, doesn’t even show Josie hopping in the field, and what I really need is to get a picture of this deer, so I switch out of movie mode and in that instant Josie figures it out, flies off the porch, runs straight at the deer full blast. 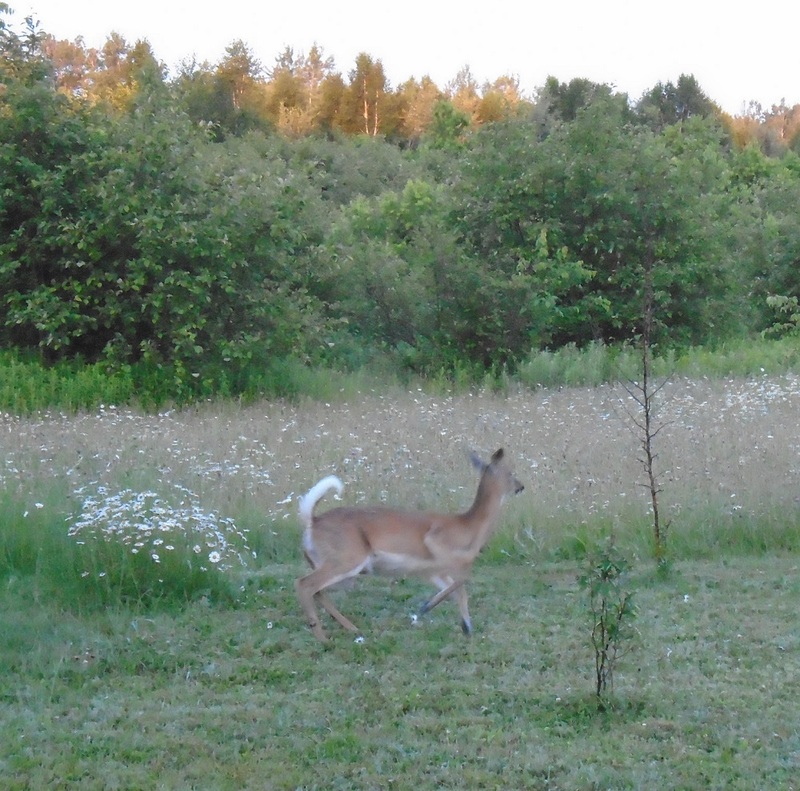 But the only thing I see is through the camera, this picture of the deer turning tail. Running from Josie. Why they call them white-tails. Josie chased the deer right into the fields of tall grass and wildflowers and then he came back and we went inside and had breakfast. Elliott, watching safely from inside, was all agog.